Bearnes Hampton & Littlewood hold four major painting sales each year which include a diverse selection of 20th Century and Modern British pictures and sculpture. From the period of Edwardian Art, circa 1900-1920, the major names include Lavery, Seago, Munnings and Stanhope Forbes to Neo-Romantics such as FL Griggs and others who began to re-evaluate their Romantic forebears such as William Blake and Samuel Palmer. The revival of the Neo-Romantic movement (circa 1930-1955) embraced the works of artists such as John Piper, Tunnard, Graham Surtherland, Stanley Spencer and Robin Tanner. Alfred Wallis – A Cornish Harbour, sold at auction for £18,000 (FS9/430). Constructivist Art (Constructivism) is a term uses to define a type of totally abstract (non-representational) relief construction, sculpture, kinetics and painting. The principles of this art derived form the three main movements that evolved in the early 20th century in Russia (the Abstraction of Kandinsky), Holland (colour compositions and the Cubism of Mondrian) and Germany. In Britain, among the leaders and most high profile of 20th century artists are Ben Nicholson, Barbara Hepworth, John Wells, Terry Frost and Michael Snow. 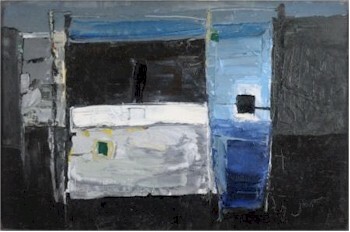 Paul Feiler (b 1918) - A Cornish Harbour. (Estimate £30,000-50,000). 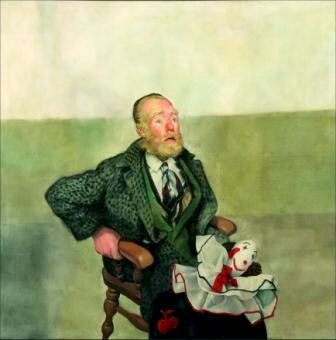 Within broader 20th Century British Painting, there are also the London School including artists like Francis Bacon, Lucien Freud, Kitja and Frank Auerbach; The Bloomsbury Group with Duncan Grant and Venessa Bell; The Kitchen Sink Group including John Bratby; The Camden Town Group whose number include WR Sickert, Frederick Gore, Wyndham Lewis, Augustus John and Charles Ginner and the St Ives School with Ben Nicholson, Christopher Wood, Alfred Wallis and more latterly Peter Lanyon, John Wells, Roger Hilton, Brian Wytner, Patrick Heron, Wilhemena Barns-Graham and Paul Feiler. 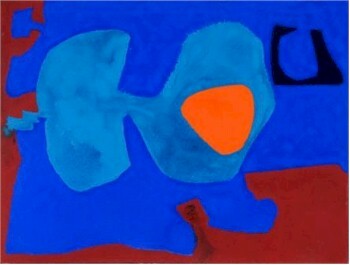 Patrick Heron - May IV, 1976. Realised £11,500 at auction. (FS12/311). 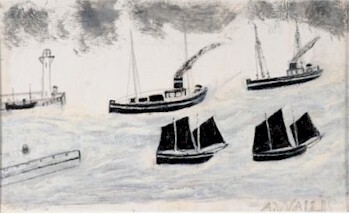 Alfred Wallis took up painting in his 60s after the death of his wife and, 'discovered' by Ben Nicholson and Kitt Wood in St Ives in 1928, was propelled into a circle of progressive artists working in Britain in the 1930s. Wallis painted 'what use to bee out of my memery what we may never see again', a reference to his sensitivity to the decline of the age of sail and the traditional ways of the fisherman. Wallis' paintings are a fine example of naive art where perspective is ignored and scale is often based on relative importance to the artist and this gives his paintings a diagrammatic and map-like quality. Wallis improvised with materials and often painted on cardboard from packing boxes using a limited pallet range from paint bought from ship's chandlers. And there are of course many other 20th century British artist who don't easily fall into schools or groups. One we should note is LS Lowry who was born in Lancashire in 1887 and whose drawings and paintings depict Salford, and the surrounding area where he lived for over 40 years. Here at Bearnes Hampton & Littlewood, we recently held the world record for a drawing by Lowry, Colyhurst Footbridge which sold for £57,000. Robert Oscar Lenkiewicz The Bishop Startled (SF1/155), which sold for £100,000 at the Lenkiewicz 2008 auction. And finally, two contemporary British artists (both from Plymouth) with international reputations; the instantly recognisable social commentary caricature art of Beryl Cook and the figurative paintings of Robert Lenkiewicz based around challenging cultural themes in modern society. Bearnes Hampton & Littlewood hold the world record for Lenkiewicz at auction and are the only auctioneers to have sold paintings by Lenkiewicz for six figure sums.